The Festival invites students from all fields of study to apply. The program is ideally suited for curious, motivated individuals who are interested in the diversity of possible careers in the arts, events, and the nonprofit world. Festival interns have gone on to have successful careers in both the nonprofit and for-profit sectors – those who have gone on to work in the arts have done so at organizations across the country, including the International Contemporary Ensemble (ICE), Pacific Symphony, Early Music Guild of Seattle, and Voices of Change, as well as forged new paths as entrepreneurial performing artists and composers. Read more about the 2018 interns here. In 2011, Ojai Valley residents Ila and Fred Rothenberg provided the Festival with a new fund to help support the internship program, which is dedicated to in memory of their son, Steven Rothenberg. Past Rothenberg Fellows are Jamie Leidwinger (2018), Fiona Digney (2017), Luke Martin (2016), Rebecca Shasberger (2015), Lauren Eales (2014), Emily Praetorius (2013), Alissa Strople (2012), and Ryan Strand (2011). Applicants must be 18 or over. Knowledge of classical music is suggested, but is not a requirement. Interns commit to 2-3 weeks in Ojai and must be available during the Festival week. Please indicate on your application if you have special schedule requirements. Complete the internship application, including the four essay questions, and return along with a cover letter and resume. Submit two letters of recommendation. Letters from college faculty should include how the applicant would benefit from the Internship, and how the Internship would strengthen the applicant’s specific college and career goals. Letters from college faculty must be on school letterhead. These letters may be sent with the application or to the office directly. Each of the Festival’s internship opportunities places interns in a specific area of responsibility, enabling them to gain specialized experience. However, the multilayered nature of the Festival means that often interns will assist in many different areas, as projects require. Read the brief descriptions below to see what might best interest you and indicate your interests in order of preference when you apply. The “good fit for” is not at all a requirement, just a suggestion. Administration interns work with the Office Manager to provide a critical central point of contact for artists, staff, and vendors. They maintain office communications and coordinate/complete projects essential to all areas of the Festival. A good fit for: interns looking to gain experience in administration, customer service, and office management. The audio/sound intern works with the production team and the sound designer for the Libbey Bowl concerts. A good fit for: interns interested in gaining experience on sound design and logistics. Development and special events interns work with the Director of Development to produce the various social and donor events throughout the Festival. They manage RSVP lists, coordinate and schedule vendors, create materials, and assist with other fundraising projects. A good fit for: interns interested in gaining experience in special events coordination and fundraising. Education interns work with the education events producer to produce the informative pre-concert lectures and talks that occur throughout the Festival weekend. In addition, they will work with the audience experience manager in providing a wonderful and safe experience for all our patrons. A good fit for: interns interested in gaining experience in event coordination and gaining experience in patron interaction. Live stream interns work with our live stream crew which videotapes performances and interviews and live streams all of them during the Festival. Live stream interns are also responsible for editing the live feed into archival video for the Festival and for YouTube. Knowledge of Photoshop, Google Docs, I-Movie, and Final Cut Pro. A good fit for: interns interested gaining experience in video editing and live film work. Stage intern works and assists Festival stage managers in various performance venues. A good fit: interns interested in gaining experience in stage management. 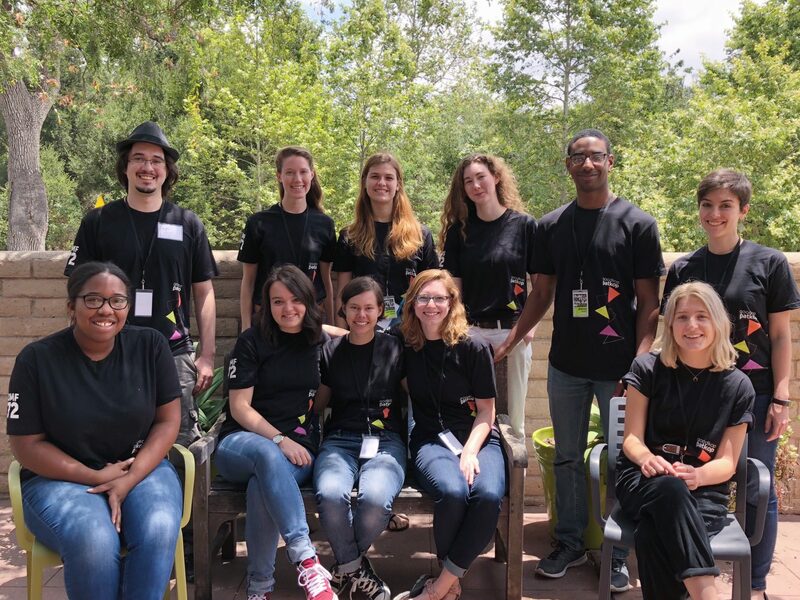 Patron services interns work in the box office, serving as a guide to the Festival experience for ticket buyers, donors, and community members. A good fit for: interns interested in gaining customer service and hospitality experience. The production intern is also each year’s Rothenberg Fellow. The production intern works with the Festival Producer to coordinate artists and their needs throughout the Festival. They also work on stage and with the Stage Manager to help produce the Festival’s concerts, manage rehearsals and performances, stage changes, and coordinate between lighting and sound engineers. A good fit for: interns interested in gaining experience in concert production. Marketing interns work with the Director of Marketing & Communications and other marketing team members in communicating with and coordinating press in the days leading up to and during the Festival. They also assist with the Festival’s social media presence during the Festival and creating and distributing marketing materials. A good fit for: interns interested in gaining experience in public relations, marketing, and social media. Retail interns work with the Retail Manager and the Marketing Director to sell and manage merchandise. They complete pre- and post-inventories, determine signage and décor needs, and provide a warm customer experience during the Festival. A good fit for: interns interested in gaining experience in customer service and retail management.